All items made of Navy Indura® Ultra Soft® with APTV of 12 cal/cm². Coat is 32″ long, generously cut and features FR Velcro front placket closure and NOMEX® knit wrists. 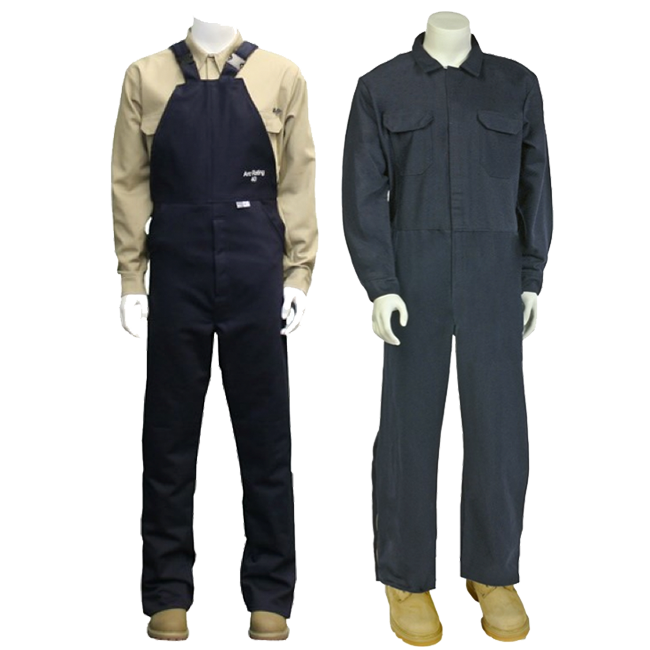 Pants (bib overalls) feature quick disconnect, easy adjust shoulder straps, FR Velcro flyand calf (easy boot entry) closures, two slash pockets with pass-throughslashes for access to pants pockets, ankle strap with FR hook and loop. Hood includes face shield and dielectric hard hat. Style selection (coat and pants or coverall) along with hood, safety glasses and storage bag. Kits ending in 0 or 2 also include indicated class glove kit which includes insulating rubber gloves, protectors and canvas glove storage bag — please indicate glove size when ordering.